Hey everyone, currently there is so much hype out there about probiotics and whether this is the new saviour to cleanse the system. Well I am definitely all for it as Ive been taking these in capsule form for the past couple of years and Ive never felt better. It all started a couple of years ago when Id been on holiday and completely overindulged. My poor tummy just didn’t feel right for weeks and everytime I ate I just constantly felt off. It didn’t matter how healthy I tried to be nothing seemed to sort me out. I was getting quite anxious about it and even made a trip to the local gp’s to voice my concern. Well after being prodded and poked and having various blood tests the verdict was that there was nothing sinister going on and maybe I needed to try and get y gut back on a healthy track and to cut down on gluten as this may cause some reaction too. So this is when I decided to go to my local Health store and stock up on probiotics, vitamins and various superfood supplements. After a few weeks with eating healthy and taking the probiotics I genuinely felt the best I had in years. Also considering that I had started back at excercising everything just seemed to blend in and I felt amazing. This is what has spurned me to write a post on it as I genuinely feel for anyone who suffers from a dodgy gut maybe try a course of probiotics and see how it feels…. Obviously go and see your GP first to rule out anything serious but if you are given the all clear like I was then it is certain that you need to revamp your lifestyle and diet. I remember my mum saying to me that she was feeling exhausted and was constantly suffering from a dodgy tum, I brought her to the health shop and made her stock up on the probiotics which I was taking. Well after a few months she began to feel back to her old self. She stopped getting colds and felt like her immune system was back on track. She also stated that she started sleeping much better at night too, Ive no idea whether this is due to the probiotics but Im sure it contributed somehow. 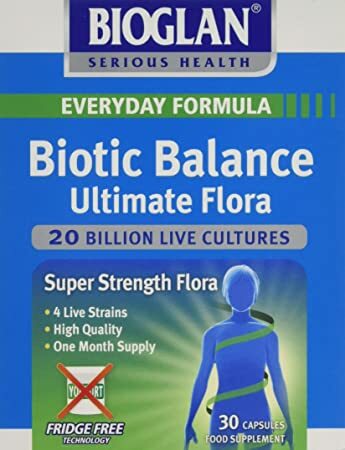 I currently take Bioglan Biotic Balance Ultimate Flora, this has 20 billion live cultures and is quite a strong one so for anyone considering giving probiotics a try I would recommend speaking with the health assistant within the store who may advise starting off on a low dose to begin with. And there you have it. If you have been feeling off for a while and your local GP cannot find a reason then I would suggest maybe taking a trip to your local health store and see what they have to offer. Please also note I am not a doctor or affiliate of Bioglan and I would strongly recommend always getting checked by your GP first if you are in any way feeling under the weather for a while. If you are given the all clear then its time to seriously sort your health and lifestyle out. Have fun peeps and enjoy your day!